Pretty like a travel commercial, The Isle provides nothing new for the horror genre. Based loosely on Scottish ghostly folklore with inspiration from Greek sirens, The Isle is set in 1846 on a remote island off the west coast of Scotland, where three survivors from a mysterious sinking of their merchant ship find themselves stranded on a small misty isle. The isle’s four sole secretive residents, an old harbor man, a farmer, his niece and a young mad woman, are anything but welcoming and reluctant to aid the sailors back to the mainland. The promise of a boat never materializes leading one of the sailors to question why people had abandoned the island. Through his investigation he discovers that every year around the same date a tragedy at sea would occur and young men from the island would perish. When his two shipmates meet with fatal accidents, the myth of a ghostly siren haunting the island leads him to try and uncover the truth. Not to bury the lead here, but this is worth prefacing: Horror has never been one of my favorite film genres. Don’t get me wrong – spook fests such as A Nightmare on Elm Street, Evil Dead, and The Cabin in the Woods hold a special place in my heart. Even recent entries such as Get Out and Halloween have made lasting impressions. Generally, though, I’m lucky to come across more than one horror flick a year that leaves any kind of significant mark on my psyche. As much as I wish they would, the average horror movie scare tactics just don’t work for me. The relative handful of horror movies I do gravitate toward tend to have something else going for them. For instance, Elm Street has its elaborate sets and scenery-chewing villain, while Evil Dead and Cabin in the Woods have their subversive humor. Get Out has its racial subtext, and Halloween boasts the kind of crowd-pleasing atmosphere typically reserved for summer blockbusters. All of this is to say that The Isle does little that I haven’t seen done much better many times before. Set in 1846, the movie opens with a violent storm sinking a merchant ship, with the three survivors landing on a remote island off the west coast of Scotland. With only four residents on this unfamiliar land, something seems off. Eager to return home, the three survivors are further unsettled when the boat that was promised to them never shows up. It isn’t too long before they decide to investigate what happened on the island – what caused all but the remaining four to abandon it. At the outset, there’s definitely some mild intrigue. Early scenes within the denizens’ houses have a somewhat thick, claustrophobic atmosphere. Additionally, some of the on-screen talent is top-notch. The prospect of seeing Conleth Hill in something outside of “Game of Thrones” was exciting, and Alix Wilton Regan of Mass Effect 3 fame is one of my favorite voice actresses working today. However, there’s only so much either of them can do to elevate the material they’re given, as The Isle’s greatest weakness is perhaps the characters themselves. 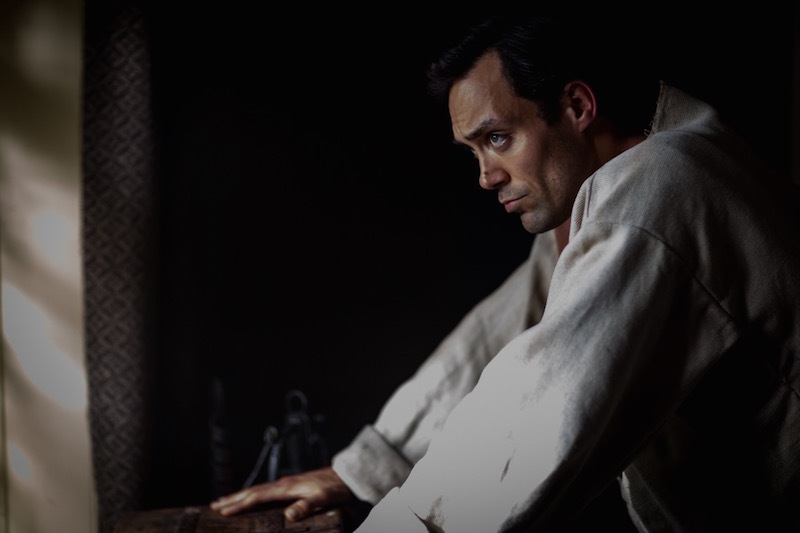 Our three fishes out of water (played by Alex Hassell, Fisayo Akinade, and Graham Butler) are one-dimensional sailors who boast almost no chemistry among one another. Worse still is that they repeatedly make basic, horror-movie-101 mistakes. The Isle plays these dumb decisions earnestly, though, which leads to a few instances of unintentional comedy. There’s even one line, in particular, that’s so cliché that Cabin in the Woods uses it verbatim for satire. Much of the movie is spent with our Islanders reading journals and generally just trying to figure out what went wrong on the island. On paper, that isn’t necessarily a bad thing – I’m all about the slow burn. John Carpenter’s The Thing, for instance, excels in part because it takes its time in showing you its monster. Despite some promising elements, including a couple of notable cast members and a solid premise, The Isle comes across as routine horror. Even as someone who doesn’t get scared easily, I – again, as I often do with horror flicks – tried to find something else to latch onto. If nothing else, the isle itself is at least gorgeous to look at. That said, there’s an exhausting number of overhead and panning forest shots – to the point that I started wondering whether I was watching a travel commercial.